Tuskegee Airmen, 1945. Photo by Toni Frissell. Prints and Photographs Division. Reproduction No. : LC-F9-02-4503-330-5 (8-6) Photo courtesy of the Library of Congress. The Tuskegee Airmen have been depicted in books, news stories and films – most recently “Red Tails” by Lucas Films. Now students in 4th through 12th grade have a chance to write their own stories – essays on how the Tuskegee flyers have inspired them. Winners will receive cash prizes. Fantasy of Flight, a Florida aviation attraction, is sponsoring the “They Dared to Fly” student essay contest as a tribute to the Tuskegee Airmen and to honor Black History Month. 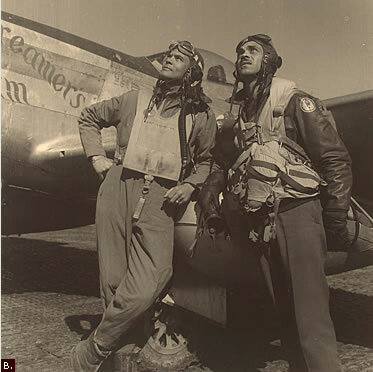 You can learn more about how the African-American Airmen helped break down color barriers in the military during WWII at the Library of Congress website. The WWII Tuskegee Airmen and supporters also maintain a website. The students should describe how the Tuskegee Airmen used the principles of leadership, excellence, advocacy and determination to succeed. Or the student can describe how they can use these values to achieve a personal goal of their own. Entries will be judged on overall content, including spelling, grammar, punctuation, legibility and penmanship. Prizes will be awarded in three age categories: grades 4-5, grades 6-8 and high school. First place essayists will receive $100; second place $75 and third place $50. Entries must be postmarked or hand delivered prior to 5 p.m. on or before February 20, 2012. An application form and the contest rules are available HERE. Additionally, Fantasy of Flight is hosting some original Tuskegee Airmen, including George Hardy of Sarasota for a special symposium series Feb. 9-11, 2012.